The German surname Schrenk is of nickname origin, being one of those which derived from some personal or physical characteristic of the original bearer. It is derived from the Old High German term "screnc" and means "crafty, sly". In Germany such men were nicknamed Schrenk and Schlau. Early records of this surname in Germany date back to the thirteenth century. In 1237 one Cunrad Schenke lived in Reichholzheim, and in 1330 Drutwin Schrenke was the Lord Mayor of Frankfurt/Main. 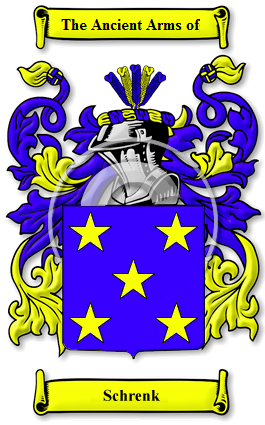 Schrenk is a variant of this surname. With the growth of documentation in the later Middle Ages, such names became essential, and a person whose distinguishing name described some personal characteristic, passed that name on to his children and the surname eventually became hereditary.